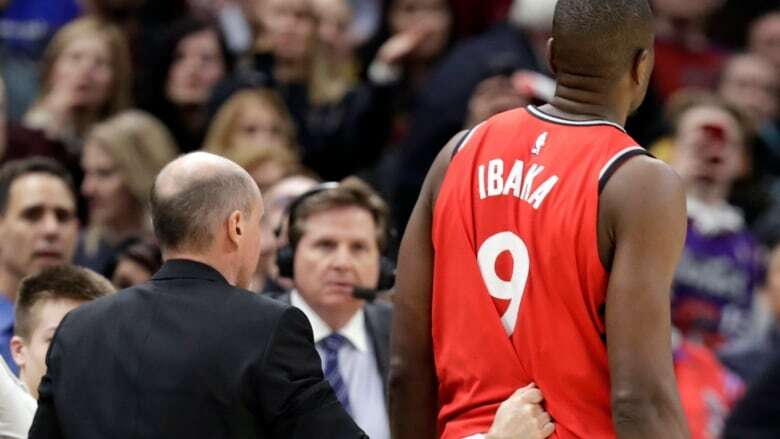 Toronto Raptors centre/forward Serge Ibaka has been suspended three games without pay by the NBA after a fight with Marquese Chriss of the Cleveland Cavaliers. Toronto Raptors centre/forward Serge Ibaka has been suspended three games without pay by the NBA after a fight with MarqueseChriss of the Cleveland Cavaliers. Ibaka and Chriss were ejected for fighting 0:01 remaining in the third quarter of the Cavaliers' 126-101 victory over the Raptors on Monday night. The NBA said Ibaka's suspension was based on instigating the fight, throwing a punch at Chriss and his prior history of fighting during NBA games. He will forfeit US$447,000 in salary. Chriss received a one-game suspension for throwing a punch at Ibaka. It's the third suspension for Ibaka since 2017 for throwing punches — with the previous two being for only one game each. Ibaka also was handed a one-game team suspension in 2017 for an altercation with a Raptors staff member. The six-foot-10, 235-pound Ibaka will miss Thursday night's home game against the Los Angeles Lakers, Sunday's game in Detroit against the Pistons and next Monday's game against the visiting New York Knicks. Ibaka's previous NBA suspensions were for fights with James Johnson of the Miami Heat last season and with Robin Lopez of the Brooklyn Nets in 2016-17.